We champion issues that affect the communications industry, helping promote the unique capabilities of senior communications leaders. 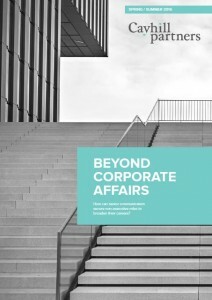 Our comprehensive report ‘Beyond Corporate Affairs; How can senior communicators secure non-executive director roles to broaden their careers’ is the result of interviews with over 100 communications leaders as well as with FTSE chairmen. And for the communications industry as a whole the research shows that it needs to be far more proactive in articulating the unique capabilities of senior communications practitioners, as well as help educate the wider business world about the value a background in communications can bring to NED and other leadership roles.